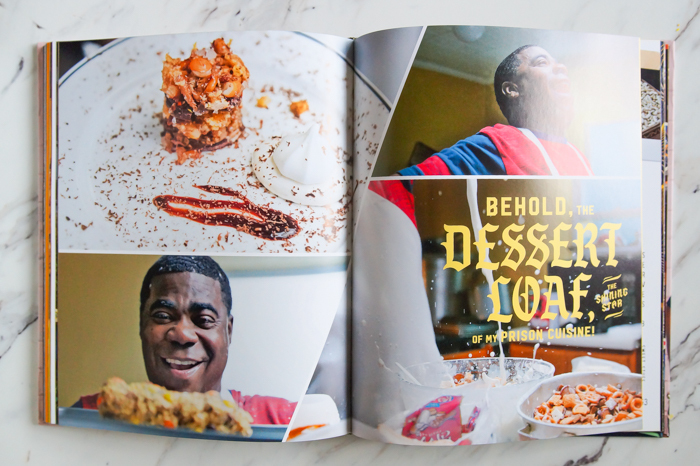 One of my very favorite things about having a blog is that sometimes you receive preview copies of new cookbooks. Seriously, it's THE BEST. 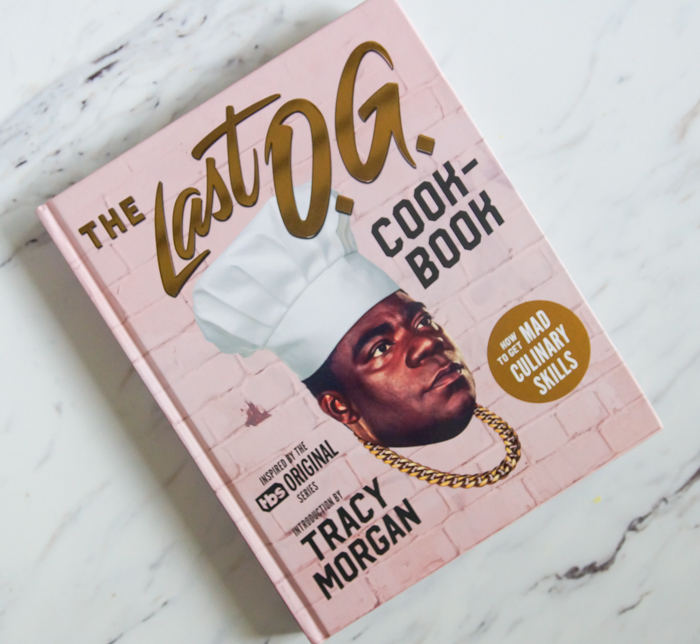 I loved Tracy's take on food, family, and community. I was also struck by his advocacy for re-entry after incarceration and food justice for communities in need. In the back of the book, several pages are devoted to nonprofits across the US helping in these areas. 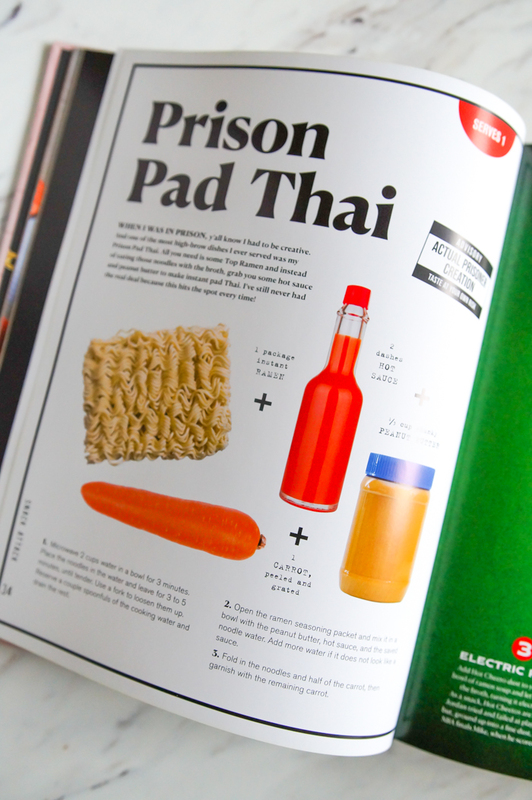 There are so many recipes that I'm going to try...Prison Pad Thai, DESSERT LOAF, mile-high biscuits, parole board bacon burger...to name a few. 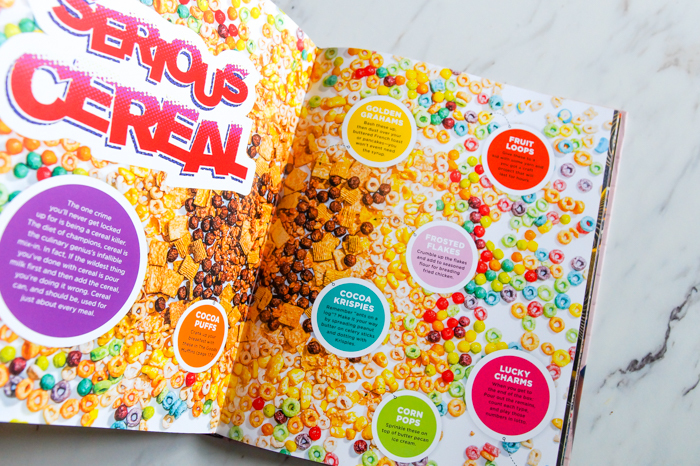 There's also a page dedicated to cereal, as in bash up Golden Grahams and dust them over buttered French Toast. I'm so doing that. 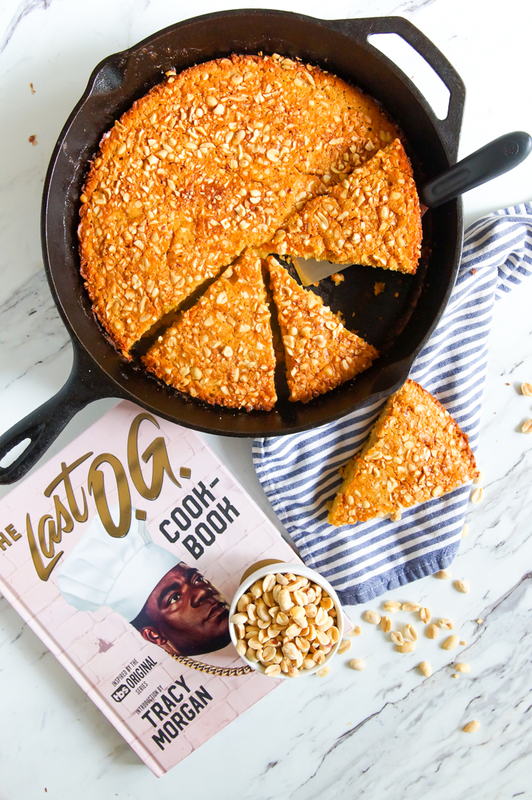 The recipe that jumped off of the page for me was Peanut Butter Cornbread. It just sounded comforting and delicious. Spoiler alert: IT IS. 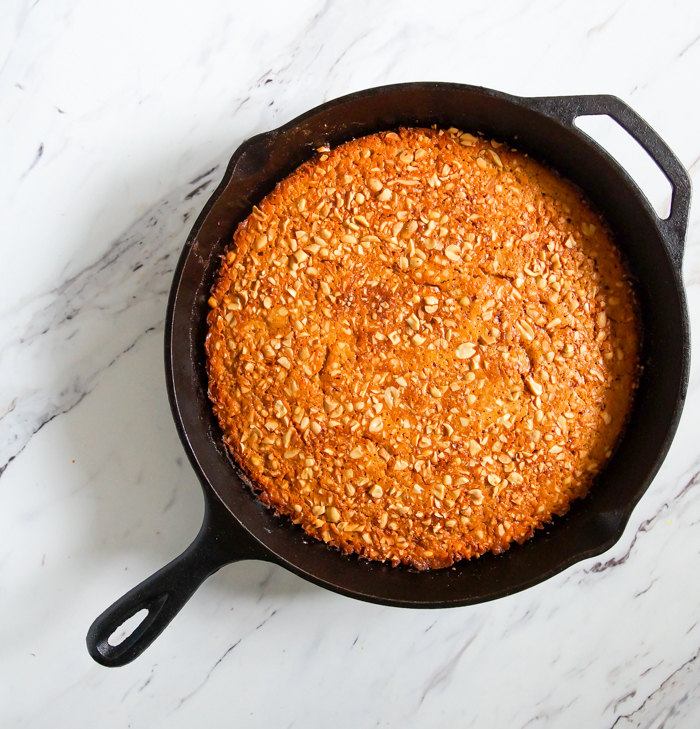 The cornbread is baked in a hot, buttered cast-iron skillet. 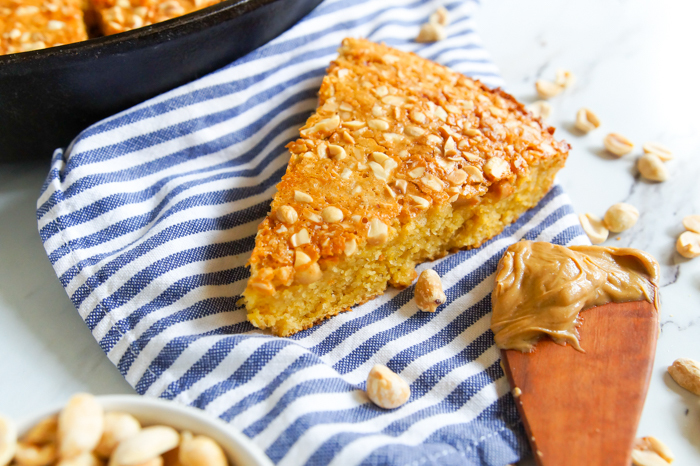 The batter includes peanut butter, and there's also a mix of crushed salted peanuts and brown butter scattered across the top. That topping, y'all? Oh, it's just plain awesome. Just be sure to use salted peanuts, not seasoned peanuts. Check the label. I've noticed that some brands of "salted" peanuts have onion and garlic powder. You don't want that here. You'll mix the dry and wet ingredients and then whisk them together. On goes the topping I was letting you about. You can serve this warm, but I like it best at room temperature...FOR BREAKFAST. That's right! 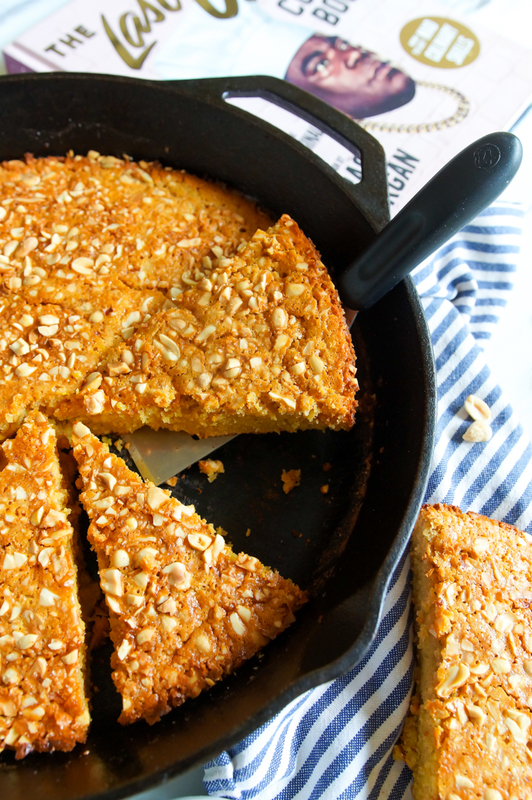 Breakfast cornbread. A little sweet, but not too much so. It's perfection with a latte. Oh, and it's also just the thing for snacking. Set oven rack to middle position and preheat oven to 400. 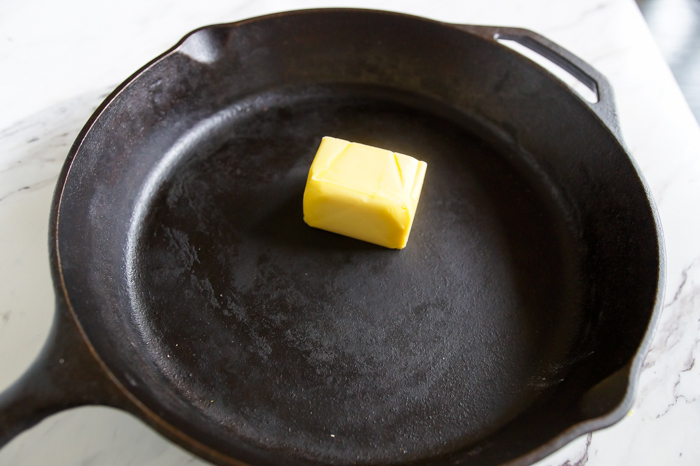 Place butter in a 10-12" cast-iron skillet, place pan the oven, and let the butter melt, about 3 minutes. Remove the pan from the oven and set aside. 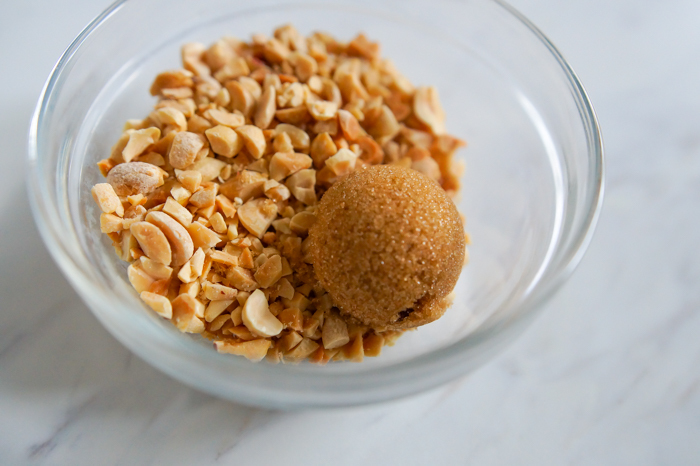 In a small bowl, mix the crushed peanuts with 1 tablespoon of the brown sugar. Set aside. In a large bowl, whisk the cornmeal, flour, baking powder, salt, and the remaining brown sugar. 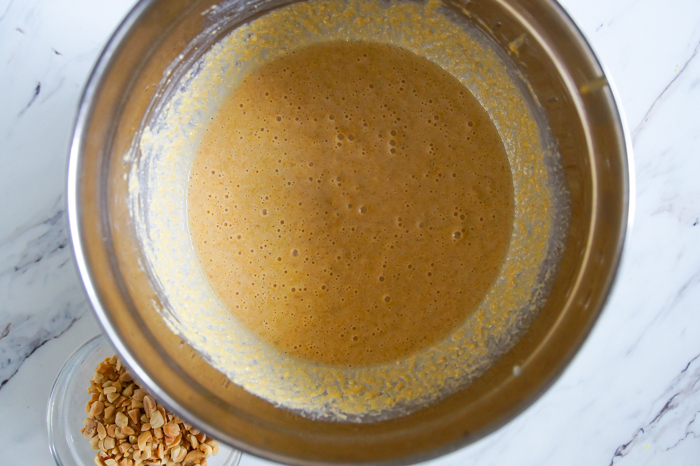 In another bowl or measuring cup, whisk the eggs, milk, and peanut butter. Pour in the cooled melted butter from the skillet, leaving the pan coated. Whisk again. Pour the liquid mix into the dry, whisking until combined. Pour into the skillet. 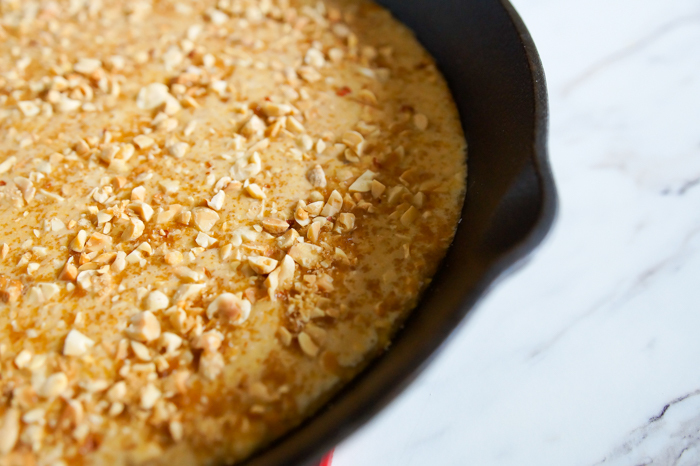 Sprinkle the peanut mixture on top. Bake for 35-40 minutes or until done.